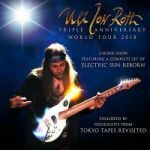 We are proud to have the Legendary Scorpions Guitarist Uli Jon Roth as he comes to the Wildey Theatre for his rescheduled 2019 North American Tour. It will be a very special and unique show. Uli will be celebrating the 40th’ Anniversary of Electric Sun, and the release of “Tokyo Tapes” It will be an evening with, with a very special 3 hour show. It will be a full set of Electric Sun, with a short intermission, and then a full set of Scorpions. It will be the first time he has done a full Electric Sun show in the US in over 30 years.Do not miss this multi-media show. It will be spectacular.